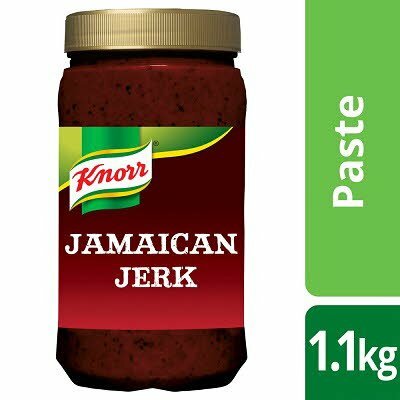 A Jamaican Jerk paste made to an authentic recipe combining onions, spring onions, allspice, cayenne pepper, black pepper and cloves. Water, onion (35%), spring onion (17%), pimento (3%), cayenne pepper (2%), salt, modified maize starch, spirit vinegar, black pepper, clove, acid (citric acid), nutmeg extract. This paste is ideal for use as a marinade or flavour base. Use approximately 1 tablespoon (21g) of paste per portion in any application. Store in a cool, dry place away from direct sunlight. Once opened, keep refrigerated and use within 14 days, or freeze remaining contents immediately. Defrost in a refrigerator and use within 24 hours.